We have two separate drawings every month for a $50.00 Amazon gift card. See below for details and eligibility requirements. A random drawing will be held on the first Wednesday of each month for a $50.00 Amazon gift card for all eligible individuals that completed our survey for one or more of our websites during the previous calendar month. Eligibility: All entrants must have completed a survey during the previous calendar month, reside in the U.S. or Canada, and must be 18 years of age or older. Only one entry per person is accepted per month. No purchase necessary. Void where prohibited. Each month’s winner will be notified by email and the name of the winner will be posted on our website. The winner will have 30 days from the drawing date to claim the prize. If the prize is not claimed within 30 days the winner forfeits all rights to the prize. A random drawing will be held on the first Wednesday of each month for a $50.00 Amazon gift card for all eligible individuals that are subscribed to our newsletter at the time of the drawing. Eligibility: All entrants must be subscribed to the newsletter for one or more of our websites at the time of the drawing, reside in the U.S. or Canada, and must be 18 years of age or older. No purchase necessary. Void where prohibited. Each month’s winner will be notified by email and the name of the winner will be posted on our websites. The winner will have 30 days from the drawing date to claim the prize. If the prize is not claimed within 30 days the winner forfeits all rights to the prize. 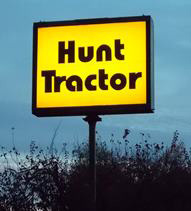 Hunt Tractor will never sell or transfer your information to another party. All information gathered is intended for the sole use of Hunt Tractor Equipment & Parts, Inc. and our subsidiaries. Mailing list subscriptions can be cancelled at any time.